"One should not build castles in the air". 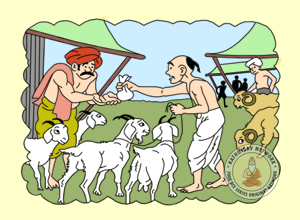 Swabhavakripna was a poor Brahmin who lived alone in a small village. He had no friends or relatives, and used to beg for alms for his living. 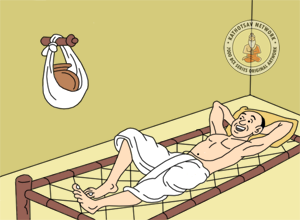 He was also a miser, and kept whatever little food he received as alms in an earthen pot that he hung beside his bed. He kept a watch on the pot, and ate from the pot only when he was very hungry. One day, he recieved a large quantity of rice gruel (porridge). He filled his pot with the rice gruel, and ate the remaining. He was so happy to have his pot full; he could not take his eyes off the pot as he lay awake in his bed. After a long time, he fell asleep and started dreaming about the pot full of rice gruel. He dreamt that there was a famine in his village. He sold his pot full of rice gruel for hundred silver coins. With this money be bought a pair of goats. His goats gave kids in months and he traded all goats for some buffaloes and cows. Soon, even the buffaloes and cows gave kids, and they gave a lot of milk. He started trading milk and milk products like butter and curd in the market. This way, he became a very rich and popular man. He kept dreaming that he then bought some horses and a large rectangular house with four buildings. 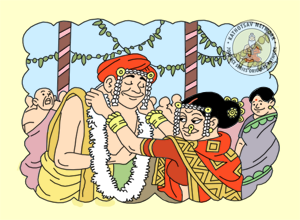 He became popular, and another wealthy Brahmin was so impressed that he offered his beautiful daughter for marriage. Soonafter, they got married in a lavish ceremony. His wife gave birth to a son, who was named Soma Sharma. But his son was very naughty. He would play and make noise all day. One day, the Brahmin asked him to stop but he would not listen. Even his mother could not hear him shout as she was busy with her chores. 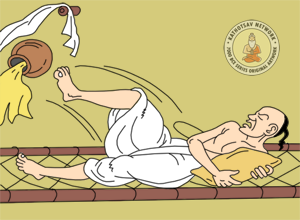 Swabhavakripna became very angry, he kicked his wife. As he was in a dream, he kicked in air and his leg hit his earthen pot. The pot broke and all the rice gruel spilled down. This woke him up. At once, he realized that he had been dreaming. He also realized that all the rice gruel he had saved and was happily dreaming about was lost. He was shattered. One should not build castles in the air.